Go on a taste adventure with our range of fine tea. 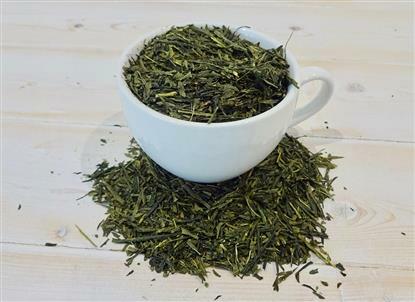 Choose from our traditional and refreshing English Breakfast Tea through to unusual Apple Pie Tea! 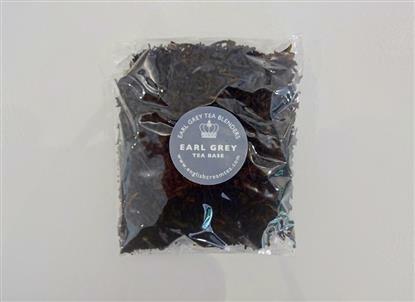 Ten pyramid-style teabags per tin OR loose leaf tea assortments too. Absolutely delicious (and as far from run-of-the-mill as you can get) range of preserves focussing on British ingredients. Choose any two and we'll wrap and post them out (standard post) asap after your order arrives to rescue your cake, toast or scones!! 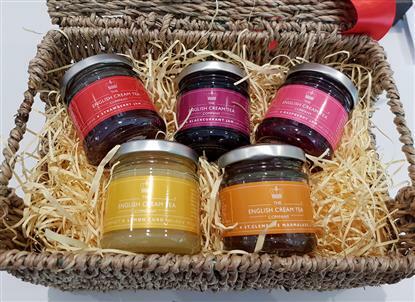 Truly special (and made with as much English fruit as possible), we offer you three different ranges of Preserves in beautiful Gift Boxes, complete with manners tips on the back and an excellent Scone Recipe inside too. Very charming, very British - and a lovely gift. Going to America or any country that has seen Downton Abbey - this is perfect to take!! Three very Cheesey Scones freshly made for your order, posted out with a 185g jar of luxury Apple, Peach and Apricot Chutney made with Whitstable Bay Ale. Delicious! 2 plump Brownies in egg shapes for you. We'll post them out first class included in the price along with your gift message if it's for someone else. Delicious? Eggsactly! These Tins of Double Chocolate English Brownies are described as 'legendary', 'awesome' and 'yummy' and they are award winning except for the year we were 'disqualified' from the Great Taste Awards because the judges said it was SO melt-in-the-mouth and amazing, they didn't believe it actually was a brownie!!! Make your tea your perfect tea - Choose from our range of delicious enhancers to add to your tea - or even your Gin! 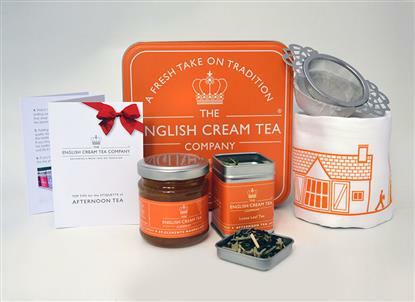 Delightful no.1 best selling hardback gift book about the great British tradition of Afternoon Tea and including an Etiquette Quiz to see if your manners are Palace ready! Price includes UK postage. See below re US deliveries. 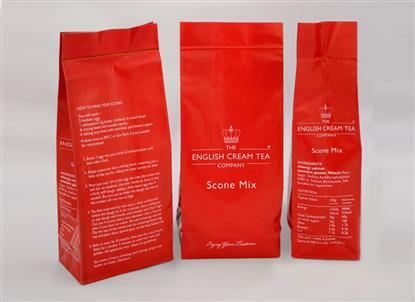 Each bag contains easy mix for 4 plump Scones, perfect for your teatime treats. 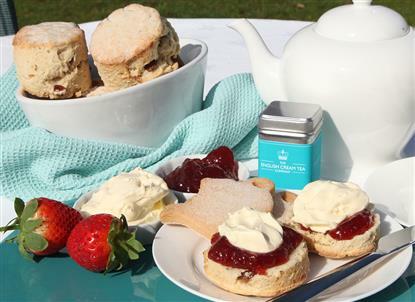 It only takes 15 mins until you're eating fresh baked Scones! See video below too. Useful tin Tea Caddy containing 4 different types of fine tea, in pyramid tea bag form. 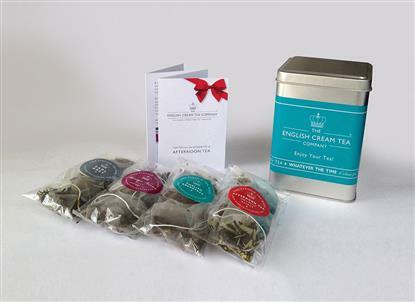 This is a charming gift or a treat for yourself if you like to try different teas. Caddies available in 3 different colours: red, turquoise or orange. Ooh, which to choose! The cutest seagrass hamper filled with all 5 of our delicious luxury preserves and tied with a silky ribbon. Tea time just got promoted! 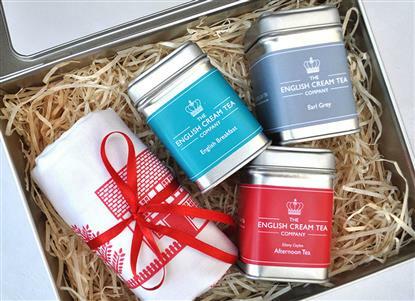 A perfect little gift tin with teas and beautiful designer tea towel that can be posted anywhere. Reduced!